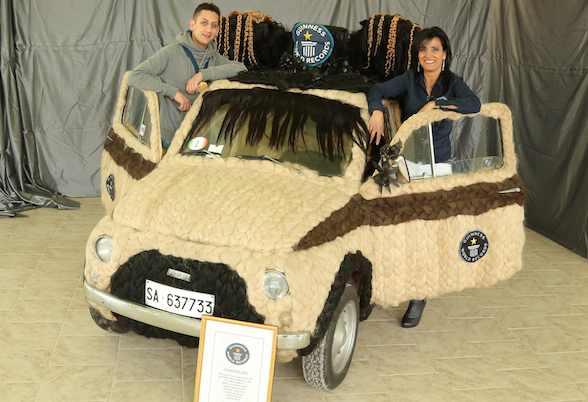 An Italian hair stylist has spent 150 hours covering her car in human hair, resulting in an entry into the Guinness Book of World Records for the world's hairiest car. 44-year-old Maria Lucia Mugno lovingly spent countless evenings sewing in the hair by hand, to both the interior and exterior of her classic Fiat 500. Her efforts saw her originally clinch the world title in 2010, but since then she has added a further 20kg of hair, netting her a new record. Ms Mugno specifically chose hair imported from India, as it is considered much stronger than hair available in Europe. However, as anybody who has bought hair extensions will tell you, human hair doesn't come cheap, and the tiny Fiat hatchback is now estimated to be worth in excess of £60,000, thanks to its hirsute adornments. She began her work after a friend wagered that she couldn't do it. So committed was she to the task that world record glory soon followed. Ms Mugno and her assistant Valentino Stassano hope that the additional hair will serve as a symbol of freedom and peace in the world, the Daily Mail reports. Quite how it is meant to represent world peace was not elaborated on. Unbelievably, the hairdresser still uses her furry Fiat as a daily runabout, using it on journeys as mundane as commuting and trips to the shops. She does like to keep it looking its best, though, and treats it to a regular brushing.